The African American Civil War Memorial and Museum in Washington, DC commemorates the more than 200,000 soldiers of the U.S. Colored Troops who served during the Civil War (1861-1865). The monument features a sculpture by Ed Hamilton known as the Spirit of Freedom. The names of the soldiers who fought in the war are engraved on plaques, placed on curved walls behind the sculpture. The museum interprets the African American experience in the Civil War. Located in the heart of the Historic U Street District, the memorial and museum serve as a reminder of the courage of the soldiers. The area has been revitalized in recent years as a center of African American history and culture. Designed by architects Devrouax and Purnell, it was unveiled in 1998. It is the only national memorial to Colored Troops in the Civil War. The Spirit of Freedom sculpture stands ten feet tall and features uniformed black soldiers and a sailor. 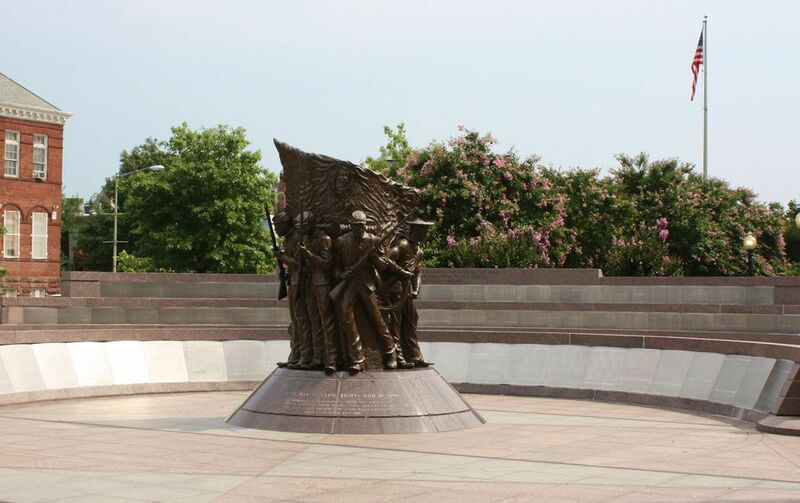 The sculpture is surrounded by a Wall of Honor, a memorial listing the names of 209,145 United States Colored Troops (USCT) who served in the Civil War. Located directly across from the Memorial, the museum displays photographs, newspaper articles, and replicas of period clothing, uniforms, and weaponry of the Civil War. The African American Civil War Memorial Freedom Foundation Registry documents the family trees of more than 2,000 descendants of those who have served with USCT. Visitors can search for relatives who have registered in the Descendants Registry. The new location opened in 2011 with over $5 million of modern, highly educational exhibitions, which highlight the story of the African American Soldiers during the American Civil War. African American Civil War Memorial - 1000 U Street, NW Washington, DC. African American Civil War Museum - 1925 Vermont Avenue NW, Washington, DC. The closest Metro Station is U Street. The museum has a limited number of parking spaces available to the public. For hours, please visit the memorial and the museum's website. Howard Theatre - 620 T Street NW Washington DC. The historic theater features a state-of-the-art acoustic system and offers a wide range of live entertainment. Lincoln Theatre - 1215 U Street, NW, Washington, DC. The 1,225-seat theatre features a state-of-the-art lighting and sound system and is a prime setting for music and theatrical performances. Ben's Chili Bowl - 1213 U Street, NW Washington DC. The landmark U Street eatery serves chili, sandwiches, and burgers.